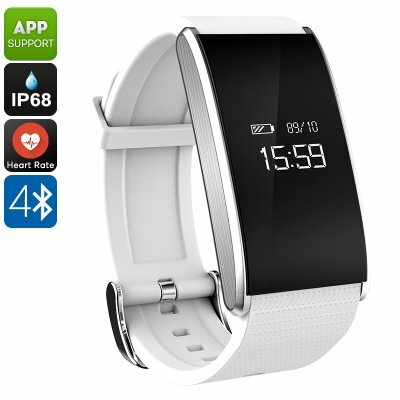 Successfully Added Ordro S12 Fitness Bracelet - Heart Rate, Pedometer, Message Notification, Sleep Monitor, Call Reminder, Anti-Lost (White) to your Shopping Cart. The Ordro S12 is a stylish fitness bracelet that makes healthy living easy. Armed with heart rate monitor, pedometer, blood pressure detection and sleep monitor you'll be able to make informed choices about your health and monitor your activates. When paired with your Android or iOS smartphone you'll get a notification when you receive a message or update on twitter, Facebook and other social media channels. The smart wristband will also alert you to incoming calls and all this information will appear clearly on the 0.66 inch OLED display..
Now you can tell at a glance if you had a missed call or message and can view the progress of your workout. With pedometer and heart rate monitor at your side you can make the most of your workouts and even store the readings to further help you track your fitness and customize workout sessions appropriately to best achieve your fitness targets. An IP68 rating keeps this sports band protected from the dirt and water as well as any sweat making it ideal for workouts in any conditions. With anti lost featuers, it will help keep track of your mobile device and a100mAh built-in battery ensures you can go all week between. The Ordro S12 sports bracelet comes with a 12 months warranty, brought to you by the leader in electronic devices as well as wholesale sports watches and fitness bracelets..